Compliance to requirements or company procedures? Entire organization? Specific area? Depth? Duration? The client makes the final decisions on which quality system elements, physical locations and organizational activities are to be audited within a specified time frame. 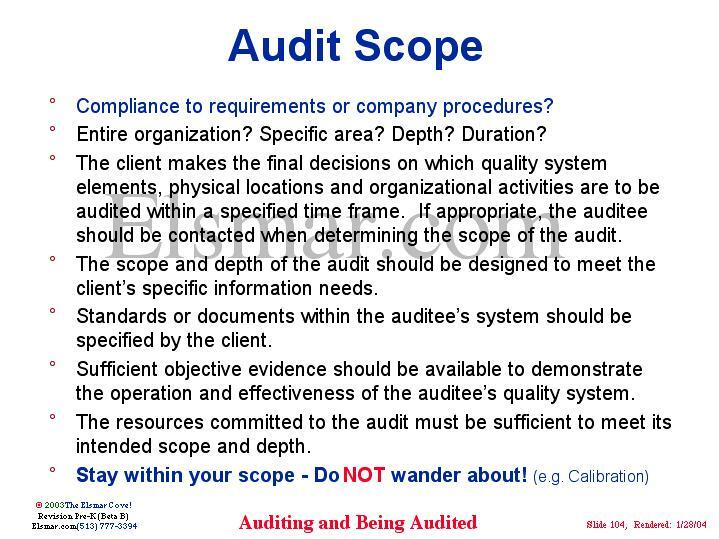 If appropriate, the auditee should be contacted when determining the scope of the audit. The scope and depth of the audit should be designed to meet the client s specific information needs. Standards or documents within the auditee s system should be specified by the client. Sufficient objective evidence should be available to demonstrate the operation and effectiveness of the auditee s quality system. The resources committed to the audit must be sufficient to meet its intended scope and depth.